"The Rising of the Black Star"
US Chess Online has recently run a story titled, "The Rising of the Black Star," highlighting the history of Black chess. WIM Jennifer Shahade had approached Daaim Shabazz about doing a segment for Black history month. While the project was not completed in February, the article celebrates the common adage that "Black History month should be every month." The article takes a look at a number of important figures in Black History and features a rare picture of Walter Harris, America's first Black master. 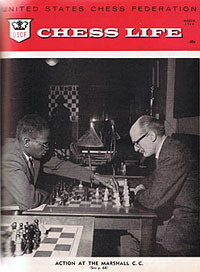 The picture was found after Daaim Shabazz had made an inquiry to the USCF about Harris' appearance on the front cover of Chess Life. Joan DuBois, of the USCF was able to find the 1964 issue. 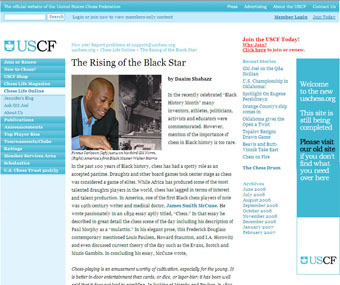 US Chess Online's Jennifer Shahade ran Daaim Shabazz's essay titled, "The Rising of the Black Star" after a request for an article with a Black History theme. "The 1980s demonstrated the effect of the Fischer Boom as a surge of Blacks reached Master level, most hailing from the east coast." Also in the article are games and thematic positions added by Shahade. Sixteen-year old Kayin Barclay's win over Jaan Ehlvest was featured as well as Pontus Carlsson's key win during his final GM norm. Hyperlinks to various articles about each of the figures were included. The article will serve as a precursor to an April 2007 Chess Life profile on Daaim Shabazz and The Chess Drum. This article was written by Gregory Kearse and provides a look at what makes The Chess Drum beat. Kearse is perhaps known for his article on Black Master in the July 1998 issue of Chess Life called, "A LEGACY OF EXCELLENCE: A Brief History of Black Chess Masters in America." Read "The Rising of the Black Star"